Seminar today in Brussels: Fish before Peace? Tuesday 16 November, 14:30 - 16:00, in the European Parliament. Speakers: former UN envoy Francesco Bastagli, Law Professor Carlos Ruiz Miguel and Saharawi human rights defender Aminetu Haidar. For access badges, please send complete name, nationality and date of birth to coordinator@wsrw.org. 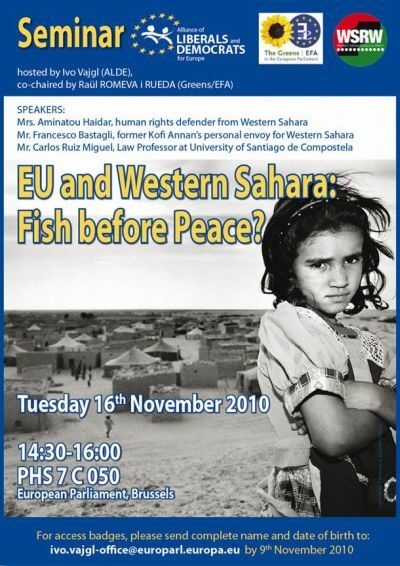 The seminar is co-hosted by Western Sahara Resource Watch and the European Parliament's Intergroup for Western Sahara. In order to obtain an entry badge, please send complete name, date of birth and nationality to coordinator@wsrw.org or ivo.vajgl-office@europarl.europa.eu.